Pretty, creative, outdoorsy - the Dandenong Ranges is weekender nirvana for Melburnians (photo: Jocelyn Pride). Rolling hills of fertile chocolatey soil, dense temperate rainforests, teeming populations of wildlife, the Dandenong Ranges (that’s ‘the Dandenongs’ for short, not to be confused with Melbourne suburb Dandenong) has been a place of abundance since the Bunurong and Woiworung people first began hunting here, in summers long ago. Settling Europeans recognised its lure too, its tall timber trees an attractive proposition for nearby booming 1840s Melbourne town. 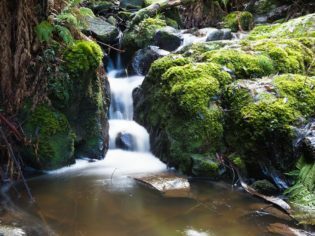 By the turn of the 20th century the Dandenongs had attracted yet another group – Melbourne’s artists, poets, musicians and dreamers, who turned it into what it is today. Visit and you’ll find charming cottages, the smells of baking, and romantic names like Olinda, Sassafras, Kallista and Emerald (monikers of the small, European-flavoured villages here), which dot the map between the area’s 35 square-kilometres of national parks. But for all its small-town charms, there are big things happening in this little enclave. We won’t call it an awakening – the creative set took care of that long ago – but there’s a renewal underway; one of those cyclical revivals that seem to happen in towns where tastemakers congregate. As the Dandenong Ranges is only 47 kilometres south-east of Melbourne, it takes less than an hour from the CBD or a little more from the airport. Once off the highway you’ll head uphill, breathe in the fresh mountain air and hear the laughter of kookaburras. Covering a large area, the region takes in many villages like Ferntree Gully, Sassafras, Olinda, Belgrave, Monbulk, Emerald, Kallista and Kalorama. It’s also easily accessed by metro train and there’s a regular bus service linking the villages.